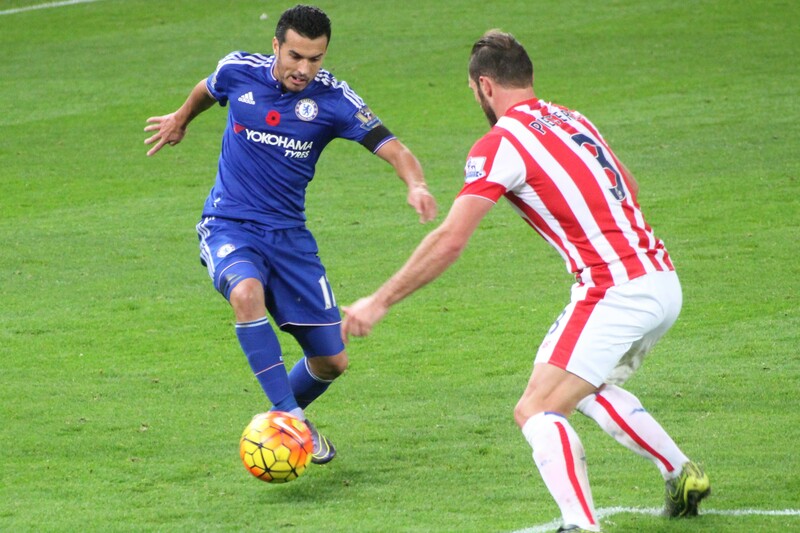 Stoke City vs. Chelsea : 7 November 2015. The day had begun in fine fashion, with Parky and myself stopping off for a mammoth breakfast apiece in the local town of Bradford-on-Avon, thus replicating the start of our trip to The Hawthorns in August. Blimey, after that game against West Brom, we thought that our season-opening blip had ended and that, surely, by the start of November our league campaign would be back on track. Straight after our galvanising breakfast, I headed back to the car, while His Lordship powdered his nose. I have a new car – a black Volkswagen – and I quickly rushed over to it, tapped the unlock function on the key fob, and let myself in, thus avoiding a few drops of rain. I settled down in the seat. I took a look around. Sandwich wrappers and parking tickets. I had let myself in to an identical black Polo and my head was spinning. I quickly exited, locked the doors, and spotted my car three cars down. Rather sheepishly, I sat inside and waited for Parky to arrive. He had a good old look in the first car just to check if I was inside. Once he realised that my car was a few yards away, he joined me. In the minute that it took me to explain what had just – bizarrely – transpired, the other car had disappeared, with its driver presumably none the wiser. We laughed. I knew that this would be a story that a few of the lads would love to hear later in the day. We wondered if, inexplicably, I had been given a VW master key. We laughed again. Despite the ‘orrible grey weather and miserable rain, I made good time on my drive north. It seemed odd to be heading back up the M5 and M6 for a second consecutive away game at Stoke City. In my forty-five years of following the team, I’d never attended two consecutive away games at the same stadium, though in the days of extended FA Cup replays, I am sure there have been precedents. Wrexham in 1982 springs to mind. At just after midday, I slowed outside Stoke-on-Trent railway station. Waiting to join us was Dave, newly-arrived on a regular service train from London. There were over five hours until our match would kick-off at 5.30pm. It was time to kick back and enjoy the familiar surroundings – stop sniggering in the cheap seats – of my old college town. We headed over to the neighbouring town of Newcastle-under-Lyme, a distinct entity to the city of Stoke-on-Trent, but not before I had given Dave a little tour past the site of the old Victoria Ground where Stoke played from 1878 to 1997. It is always galling to see an empty space, overgrown with weeds, where Sir Stanley Matthews once shimmied and swayed. From 1985 to 1987, I lived no more than fifty yards from its away end. There was an unsurprising dart in to a favourite menswear shop of yore, still selling casual gear of a high standard to this very day. I told the story of how I bought a “Best Company” T-shirt in the same shop in 1986 for the then astronomical price of £25 and how I felt like the dog’s doodahs when I saw the very same label being worn by Italians on holiday later that summer. If only I had kept it, I am sure it would be worth a mint today. We enjoyed a pint in “The Golden Lion” while the Huddersfield Town versus Leeds United game was being shown on TV. It is hard to believe that there are new Chelsea fans that have never experienced a Chelsea against Leeds league game. Though out of sight, Leeds are never really too far out of mind. They are a massive club, and it feels very odd not playing them every season. They were, of course, League Champions in 1992 and are a good example of how successful clubs sometimes implode. Whisper it, but after narrowly edging the other United to the League title in 1992, they finished in lowly seventeenth place the following May. I can well remember that they didn’t even win a single away game in 1992-1993. At least we have West Brom this season. One supposes that there may well have been a grain of truth in those words. Anyway. Leeds United. There you are. Hopefully the only time that they feature in these match reports for a few years. We popped next door into “The Kiln.” By this time I had spilled the beans to Dave about my worrying escapade involving the two Volkswagen. This kept us chortling for a while, but there was also serious talk about the chances of us filling Wembley if we end up in exile from Stamford Bridge for three or four years. On the walk back to the car, the boys sampled the delights from the nearby “Wrights Pies” shop. I know this sounds silly, but the three of us were having a cracking pre-match. On getting back to the car park, Dave tee’d me up nicely. I pointed out where Alan Hudson, still heavily revered in The Potteries, used to own a wine bar in the ‘eighties, then aimed my car over the hill and down in to Stoke once again. I parked up outside a no-frills boozer called “The Terrace” which was just across the road from my old college, in an area called Shelton, and, specifically, its playing fields. This pub, though to the north of the station whereas the Britannia is to the south, was where the Chelsea fans were basing themselves. We were over two miles away from the stadium. There was a police van parked outside, no surprises there. I passed over a spare ticket to a mate, and said a few “hellos” to a few familiar faces. I never used to drink in “The Terrace” back in my student days – I was more “Kings Arms”, “Roebuck”, “Station”, “Corner Cupboard”– but I must have visited “The Terrace” at some stage in those drinking years of around thirty years ago. The clouds were subtly changing colour overhead – now tinged with the embers of a dying sun – and it was noticeably colder. I stood with my pint of lager and was lost in thought as I looked over the road at my former college. Right opposite from where I was standing, I had played in many games of football on the college playing fields. It felt strange. The memories of a spectacular volley which narrowly whizzed over the bar from my right boot some thirty yards out, a couple of goals here, a tackle there. Memories of friends. 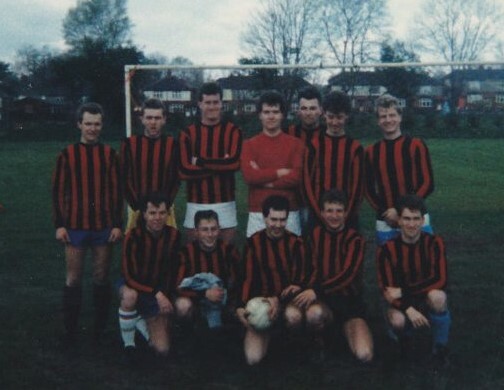 The class of ’87 – with “The Terrace” fifty yards out of shot to the left. Mike, Dave, Bob, Adam, Rick, Ian, Richie. Chris, Sean, Trev, Nige, Steve. Five of these lads – Bob, Ian, Richie, Nigel and Trevor – have stood and sat alongside me at Stamford Bridge for more than a few games over the years, bless them all. It was quite surreal to be back. However, it was even more surreal back in early July this year when around fifty – a nifty fifty rather than a naughty forty – met up for a college reunion. We had a magnificent time. Of the lads pictured in the team photo, six were there. I had not seen Rick and Sean since graduation in 1987, nor Steve since 1995. We took over the old Student Union, now modernised and plush, and loved every minute of it. At times, 1987 seemed like last year. I know it is a most hackneyed saying, but where does the time go? On the walk towards the Britannia Stadium, there is a section of footpath which cuts alongside the Cauldon Canal. For the past few seasons, a canal boat has been moored, and that distinctive Potteries delicacy the oatcake has been sold. I was in too much of a rush to indulge at the League Cup game, but on this occasion, I was able to stop and sample one. I treated Dave and Parky too. They went down a storm. My two match day companions were duly impressed. As we turned the corner at the top of the path, just before the bridge over the canal, a Stoke City supporter was selling the club’s fanzine, “The Oatcake.” Time for a culinary diversion methinks. Similar in appearance to a pancake, these cherished snacks are made without eggs but with oats and flour. They were the staple diet of a few fellow students while at college. The boys were getting the complete Stoke experience. “Wright’s Pies” in ‘Castle, a couple of pints in Shelton, and now oatcakes in Sideway. I was soon inside the away end at The Britannia once again, a mere eleven days after the last visit. This time, the four of us – Al, Gal, Parky, myself – were in the lower tier, but right behind the goal. The time soon passed. There was a raucous air of defiance within the Chelsea ranks. I was lifted by our performance against Kiev, and was adamant that we would win this one. The team line-up showed a few noticeable changes. Begovic – Azpilicueta, Terry, Zouma, Baba – Matic, Ramires – Pedro, Hazard, Willian – Costa. One familiar face was missing. Jose Mourinho, locked away in the Fenton Travelodge along with his tea and coffee making facilities, trouser press and free wi-fi, was nowhere to be seen. We presumed that he would be in constant contact with the makeshift management team of Rui Faria and Steve Holland. For a while before the teams appeared, the stadium resounded to applause for the various strands of the armed forces – from army cadets through to those serving today to veterans – as they walked the perimeter of the pitch. The two captains, Shawcross and Terry, lead their players out. There were servicemen and women to the left and to the right. After the handshakes, the teams reassembled in the centre circle. There was a little applause, but thankfully this soon evaporated. Silence, save for a perfect rendition of The Last Post. The game began well for Chelsea, and I was very pleased to see Eden Hazard, especially, taking the ball towards the Stoke defence time and time again. He seemed to be heading back towards a more confident place. The Chelsea fans around me seemed to be cheered. The noise was fine. We came close with efforts zipping across the Stoke six yard area. Pedro and Hazard seemed to be on form, and we were pretty much on top. However, as the half progressed, Xherdan Shaqiri – so short that his arse rubbed out his footprints – kept getting the better of an increasingly nervy Baba at left-back. Sadly, rather than yells of support for our defender, there were groans of annoyance. He ended up having a torrid time. Charlie Adam, one of my most disliked players of this and any year, continued his personal vendetta on all things blue and chipped away at Pedro. A fine move found Diego Costa, wide right, but his shot was poor. Despite Chelsea having most of the ball, Stoke were edging back in to the game. Sadly, soon in to the second period – and with Jose Mourinho pacing around room 14 of the Fenton Travelodge, nibbling on a Harvest Crunch biscuit – our game plan was hit with a body blow. A cross from the Stoke right, indecision in our ranks, and a swivel in mid-air from Arnautovic at the far post. With that, the home supporters sung – very very loudly – their theme tune “Delilah” and I have to admit it was pretty impressive. And Jose Mourinho punched a hole through to room 15. The Chelsea support rallied straightaway, but easily fell into the silly trap of “You Never Won Fcuk All”, ignoring the simple fact that Stoke City beat Chelsea Football Club at Wembley in 1972. The rest of the game, regardless of individuals involved, seemed to follow the same pattern. Chelsea in possession, Stoke with a blanket defence. Chelsea keeping the ball, Stoke tackling hard. Chelsea running wide, Stoke keeping their shape. Chelsea unable to break through, Stoke standing firm. Chelsea nil, Stoke one. Willian’s free kicks for once, were poor. Hazard seemed the one to unlock the defence, but he seemed increasingly forlorn. The Stoke challenges, of course, bordered on the grotesque. The Chelsea supporters grew frustrated but we still tried our best to help entice a goal from somewhere. Our support only waned slightly. So much for winning, this was a game we now needed to draw. At the other end, thankfully all of Stoke’s rare attempts on goal were wayward. Then, hope. A fine move involving Matic and then Hazard set up Pedro, who opened up his body and aimed a curler at the far post. The ball hit the base of Butland’s right post and bounced away to safety. I turned around and screamed. Mourinho knocked a hole in to room 13. Fabregas and Oscar came on in place of Baba and Pedro, but in all honesty offered little. Pass, pass, pass, block, block, block. We rarely got behind Stoke, we rarely put Butland under pressure. The home fans, realising that they were close to a memorable double over the reigning champions grew louder. We played three at the back. John Terry moved forward to support the attack on more than one occasion, with Matic dropping back. To be fair, Remy seemed to inject a little more directness in to our play. The Chelsea support seemed to be rapidly losing patience with Costa now. With time running out, Remy was set free inside the box. The ball was just ahead of him, but we sensed a real chance. In the flash of an eye, Butland came out to block, Remy hurdled him, but lost his footing, with the ball running wide. He slipped, and the shot was shanked high. Without the benefit of an action replay, I stood dazed, trying to evaluate what I had seen. On another day, Remy would not have been so quick to react – nor as honest – and Butland would have given away a penalty. A few half-hearted chances were created, but there was a mood of gloomy pessimism inside the away end now. There would be no last gasp goal at Stoke City on this visit. We clapped the boys off at the end, but I was so disappointed. Chelsea had played well in fits and starts – the fight was there, but not the know-how – and this was another tough loss. If only the Stoke defence was as easy to unlock as that black Volkswagen in Bradford-on-Avon. And, how hateful, another international break – two long interminably long weeks – for us to stew in our own juices.